Red Willow Vineyard and WA Wine Royalty - Write for Wine: It's Wine O'Clock Somewhere!Write for Wine: It's Wine O'Clock Somewhere! Red Willow Vineyard is the furthest western vineyard within the Yakima Valley AVA. It is made up of four distinctive blocks, The Chapel, Les Vignes de Marcoux, Olney Springs, and Peninsula; Marcoux is the maiden name of Mike’s mother. 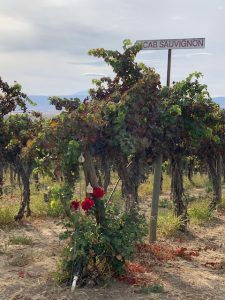 The vineyard supplies fruit to more than 30 wineries in Washington and Oregon, including Avennia, Betz, DeLille, Efeste, Eight Bells, Gramercy, Kerloo, Lady Hill, Mark Ryan and Owen Roe. One of the most recognizable and photographed spots in Washington wine country is located on top of a steep hillside. This chapel is made of stones from the vineyard, and provides a place to rest and reflect. The chapel also gives a strong identity to Red Willow Vineyard. 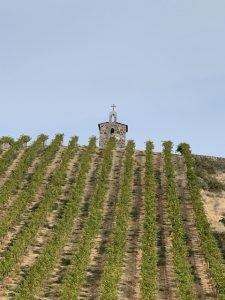 The Sauers completed the chapel in 1997, 24 years after the first Cabernet Sauvignon vines were planted. Those 1973 Cab vines still produce grapes, showcasing this meaningful location in Washington state history. Red Willow is part of a fourth-generation family farm established by Clyde Stephenson in the early 1920’s. Mike Sauer married Karen Stephenson and they began the vineyard in the early 1970’s. That’s when Mike started experimenting with growing different grape varieties, working with Washington wine pioneers and legends Dr. Walter Clore (the acknowledged “Father” of Washington wine) and Master of Wine David Lake, who became a dear friend. 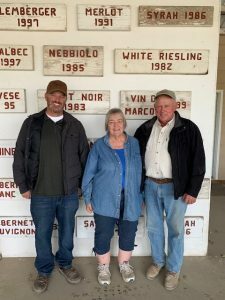 A decade after those 1973 Cabernet vines were in the ground, the Sauers planted Washington’s first Syrah and an acre of Nebbiolo in the mid-1980’s. Some of the region’s earliest vines of Tempranillo, Viognier, Barbera, Malbec, Mourvèdre, Sangiovese and Cab Franc were planted at the vineyard as well. As the story goes, after the Syrah vines were first planted, the crew had a party to celebrate. David Lake opened bottles of French Syrah (Hermitage and Côte-Rôtie) from the northern Rhône Valley where Syrah originated. Then Mike and David dug a hole and buried the bottles to let the vines know about their predecessors. Those bottles are still there. Today, Mike, his sons Jon (pictured above) and Danny, and son-in-law Rick all work 140 acres of wine grapes at Red Willow Vineyard. Mike and David started experimenting with clones in 2005, using different cuttings certified from the UC Davis Viticulture and Enology program. 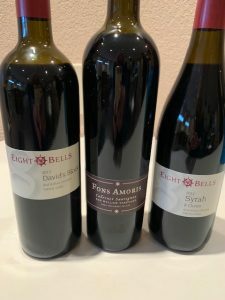 Our next blog post look more closely at this more recent part of Red Willow history, including three wines made of vineyard clones for Eight Bells Winery and Lady Hill Winery. Meanwhile, we extend our deepest thanks to Mike and Karen Sauer for their hospitality and kindness in hosting us at Red Willow Vineyard. Our experience was even more special than our first visit in 2009. This entry was posted in Barbera, Cabernet Franc, Cabernet Sauvignon, Malbec, Mourvedre, Sangiovese, Syrah, Tempranillo, Viognier, Washington, Wine, Yakima Valley and tagged Avennia, Betz, Cab Franc, Cabernet Sauvignon, David Lake, DeLille Cellars, Efeste, Eight Bells Winery, Gramercy, Kerloo, Lady Hill winery, Mark Ryan, Mike Sauer, Owen Roe, Red Willow Vineyard, Syrah, Washington wine, Washington wineries, wine, wineries by Margot. Bookmark the permalink.